Properties in New South Wales average 4.5 out of 5 stars. 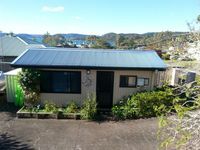 Property 10: Cute SARADISE COTTAGE......Saratoga, Central Coast N.S.W. Property 28: Enjoy a round of golf while staying in our cozy country cabin. The Beach Bungalow perfect for couples. Property 37: The Beach Bungalow perfect for couples. Property 39: Bush block and ocean! A winner- trees, wildlife and the sound of the ocean! 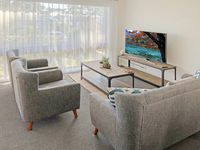 Sandbar Holiday House - Central, River Frontage! Property 46: Sandbar Holiday House - Central, River Frontage! Great value for money. The villa is in a fantastic location- close to beaches and shops. It is fresh, clean, and stylish. The host was quick to respond to any communication and very accommodating. Comfortable beds. Great internet, smart TV was a great feature. The coffee machine also an added bonus. Absolutely everything you could ask for for a wonderful family getaway! Thanks!